London, United Kingdom, Thursday 15th November 2018 – Hermes Logistics Technologies has been selected as the new Cargo Management System (CMS) provider for UAE-based logistics specialist RSA National (RSAN). As a leading provider of CMS Hub Management System (HMS) and Hermes Business Intelligence (HBI), Hermes will optimise cargo handling capabilities for RSAN at its new flagship air cargo terminal at Dubai World Central. Hermes 5 (H5) is the latest version of the Hermes application offering the latest best-of-breed functionality, a contemporary User Interface / User Experience delivered through a robust cloud infrastructure. “This will be a full SaaS Hermes 5 implementation and we anticipate a quick implementation of fewer than three months from contract to go-live,” said Yuval Baruch, Chief Executive Officer (CEO), Hermes Logistics Technologies. “We are particularly proud that RSA National selected Hermes after they identified our close fit to their vision and strategy as well as the high level of Hermes responsiveness,” Baruch added. RSAN is a new joint venture between US-based National and UAE-based RSA Global, and is an integrator offering multimodal supply chain solutions focused primarily on the e-commerce, perishables, government, humanitarian, and retail sectors. H5 will provide RSAN with its own, fully integrated management tool that will interface with its local community and customers, allowing for smarter process flows as well as messaging compliance. “Our steadfast goal is to steer our operations with utmost visibility and control, and to extend the same facility to our customers. Hermes commenced the global rollout of H5 earlier this year with the implementation of its CMS at ALS Cargo Terminal Co, Ltd at Noi Bai International Airport in Hanoi (HAN), Vietnam followed by LuxairCARGO at Luxemburg Airport (LUX), and recently at UASL (Ultramar Group) at Comodoro Arturo Merino Benítez International Airport (SCL). All HLT applications are designed and driven by the HLT team of air cargo experts. Built with the specific requirements of air cargo handlers and airlines in mind, HLT products streamline cargo ground handling processes and maximise profits by using inbuilt best practice to reduce handling and operational errors. Visit Hermes Logistics Technologies Ltd.
RSA National is a multimodal supply chain solution provider formed from a JV between third party logistics specialists RSA Global, and freight forwarding and logistics experts National Air Cargo. RSA National is poised to provide best-in-class contract logistics, cold chain, international freight, transportation and chemical logistics solutions to the air transport, pharmaceutical, perishable, military and other industries. 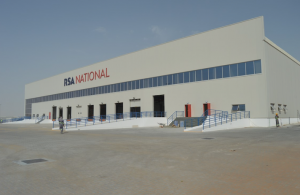 RSA National’s multimodal logistics hub is situated in Dubai South between Al Maktoum International Airport and Jebel Ali sea port.